Someone wrote it down very nicely in there! Hey ho. I'm new to the Game and i tried your Build but i have a few problems. I got always run out of mana and missiles do not that good damage du clear out fast enough big packs. I use the blood skill (fire stuff) but im constantly on 1 hp and dying very often. I'm in act 2 normal and the playstyle is not very fun at the moment. Have you some tips for me? Beginner Gear or something like that?! Dummheit wrote: Hey ho. I'm new to the Game and i tried your Build but i have a few problems. I got always run out of mana and missiles do not that good damage du clear out fast enough big packs. I use the blood skill (fire stuff) but im constantly on 1 hp and dying very often. I'm in act 2 normal and the playstyle is not very fun at the moment. Have you some tips for me? Beginner Gear or something like that?! is 100% broken, get this first. It's going to be hard to get arcane crystals really efficiently at Act 2, but Andariel runs aren't the worst. At least it'll give you some stuff and you can work on your positioning and such. I suggest summoning Fire Elementals to soak up damage. It's kinda annoying, but they get better as you get levels. I don't mean this rudely but if you're new to the game there's a lot to learn about monster attacks and how you need to position yourself, so that's part of the struggle, too. Median has a lot to learn. At your level, I'd say max out skills in this order: Bacchanalia, Magic Missiles, Fire Elementals, Balance. Get a few in Defensive Harmony to slow attackers. Don't split points between multiple damaging spells. It spreads you too thinly and then you become bad at everything instead of really good at one thing and mediocre in the rest. Balefire uses your life (as you already know) so I don't suggest using that (as a total new player). Use Magic Missiles (smaller packs, single target) and Lava Pit (for big packs). Magic Missiles when you're buffed with your innate Blood Fury is better 99% of the time. Similarly, if you're below 66% HP (and thus have Bacchanalia activated), use Magic Missile. Are they of any use? Yes, I would use both of those until you get something better. MO Phys/Magic damage on both. That ring is extremely strong because you'll have 30% Phys/Magic and +1 skills--that's going to be almost impossible to beat. 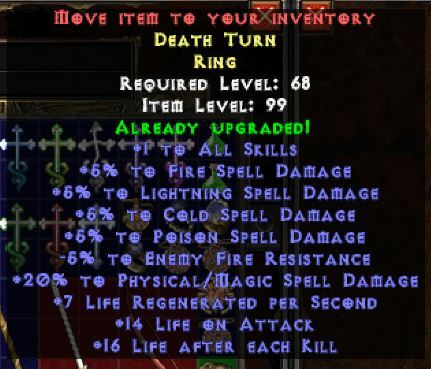 The amulet would only get better if it has high life and/or its own Phys/Magic damage. thanks for the build guide, i seem to be having massive issues with maintaining mana, how do you keep your mana up ? dilligence wrote: thanks for the build guide, i seem to be having massive issues with maintaining mana, how do you keep your mana up ? First of all, fantastic guide and really fun build to play but I have a question. How do you deal with magic absorb? In previous versions of Median I always wanted to be able to farm Teganze, but didn't have a build strong enough to survive. This build absolutely destroys in there... except the magic absorb who it heals. I did try using the fire spells from the blood tree on those, but its just not the same in terms of kill speed and of course requires more management than hold right click to win, but that's likely me being lazy!